South Korea knocked North Korea out of the women's team recurve archery event at the 18th Asian Games on Saturday. 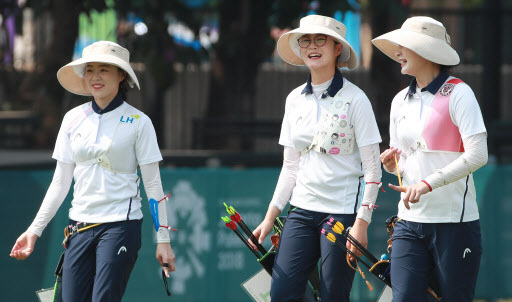 Chang Hye-jin, Kang Chae-young and Lee Eun-gyeong of the South Korea defeated Kang Un-ju, Pak Hyang-sun and Ri Ji-hyang by the set score of 6-0 in the quarterfinals at GBK Archery Field in Jakarta. Team recurve matches use the set system, where each side receives two set points for winning a set of six arrows -- two arrows per archer. If two teams are tied in the set, they each get one point. The first team to reach five points wins the match. South Korea got a bye to the quarterfinals, while North Korea defeated Vietnam 5-3 in the round of 16 to set up the all-Korea showdown. South Korea won the first set handily by a score of 56-46. Lee, Chang and Kang each hit a 10, while Ri had a 6 for North Korea. North Korea shot a little better in the second set with 52, thanks to 19 out of possible 20 points by Kang Un-ju, but South Korea put up a 55, with Lee, Kang and Chang shooting three straight 10s to close out the set victory. Pak had a 7 and a 6 in the third set for the North, while the South held steady with 10s from all three archers for a decisive 56-49 win. South Korea, the world's preeminent archery power, has stumbled out of the gate in Jakarta. On Thursday, Chang, world No. 1 and two-time Olympic champion, lost in the quarterfinals of the women's individual recurve event. Her teammate Kang Chae-young was knocked out in the semifinals, setting up the first Asian Games women's recurve final without a South Korean. Chang's woes continued on Friday, as she and teammate Lee Woo-seok lost in the quarterfinals of the mixed team event. South Korea came to Jakarta looking to take home seven out of eight gold medals, but the most it can win now is six.